If there’s been a silver lining in the difficult last 14 months on campus, it’s been the abundance of teachable moments provided by the Sandusky scandal and its fallout. That’s a cliche (and one I normally try to avoid), but hey, this is a university, right? Everything should be fodder for learning. Mike Poorman ’82 has made the most of those opportunities since the scandal broke. A journalist and longtime faculty member in the College of Communications, Mike created and taught the famous “JoePa” class, and he’s been tying the scandal into his teaching since the week the story broke. He continues to do so in his new class, Comm 170: Introduction to the Sports Industry. 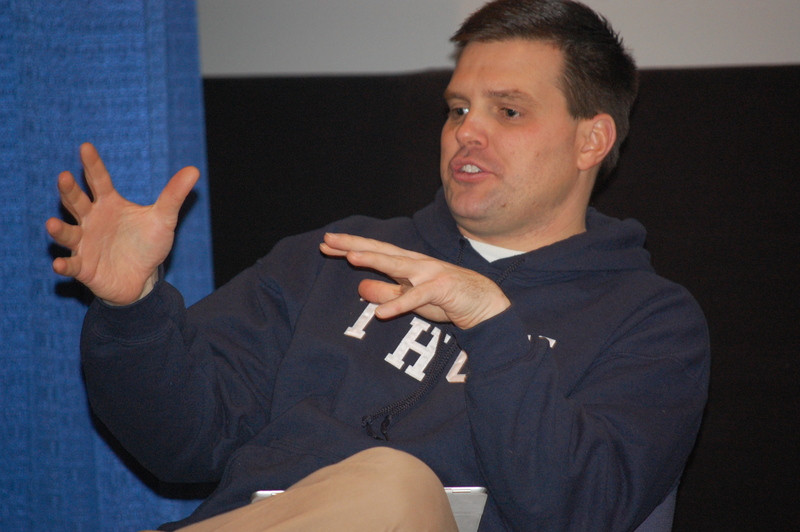 I dropped in on Mike’s class Friday, when the guest speaker was none other than Jay Paterno ’91. For these students, a mix of communications majors who might end up in journalism, public relations, broadcasting, marketing, or who knows what else, it was a rare look at the process of sports business—which, for the media companies that hosted Jay in more than two dozen interviews in the past five days, is exactly what this is about. Jay talked honestly about how he and his family decided which TV and radio shows to speak to in their recent media blitz, and how to approach each: understanding the demographics of each show’s audience, preparing for each host’s interview style (agreeable or aggressive? rational or emotional? ), and tailoring the family’s message to each. I’m not sure all of the 75 or so students fully appreciated the insights Jay had to offer; it was a Friday afternoon, of course, and the start of THON was just a few hours away. But I think those who were paying attention learned a bit about what goes on behind the curtain, both for the folks with a financial stake in the multi-billion-dollar business of sport, and for the folks hoping to use the media to tell their story or make their case. In this story, the teachable moments don’t cease. Entry filed under: Uncategorized. Tags: Jay Paterno, Mike Poorman.